Carrington Rotation 2213 covered the time period from 2019-01-16 1954 UT – 2019-02-13 0406 UT . The rotation showed one Active Region, AR2733, which lasted for 9 days. 19 Days no sunspots were observed. The highest Daily Active Region Area for the rotation was 90 millionths on, January 28, January 30, and January 31, while the total active region areas for the rotation was 560 millionths. The highest Wolf number for the rotation was 27 on January 27. Four reversed polarized areas (cycle 25) were observed during the period. The first one on February 6th and the remaining 3 on the last three days of the rotation. Our archive shows three images that show the mentioned regions. Overall Solar Activity remained Very Low and the rotation ended with spotless day 393. During the rotation the Sun produced 41 C-class and 5 B-class flares. This time we would like to feature some images submitted by three of our observers, Gabriel Corban, as well as Talha Moon Zia with a nice collage of AR2733 and David Teske’s drawing. Please click the thumbnails below to see the full images. Thanks to all contributors for another great rotation. Please take a look at all the drawings/images by clicking on the link above which will bring you to our archive for CR2213. Carrington Rotation 2212 covered the time period from 2019-12-20 1152 UT – 2019-01-16 1954 UT . The rotation showed one Active Region, AR2732, which lasted for 6 days. For 21 days no sunspots were observed. The highest Daily Active Region Area for the rotation was 90 millionths on January 4 while the total active region areas for the rotation was only 200 millionths. The highest Wolf number for the rotation was 16 also on January 4. Two small areas showing Cycle 25 polarization could be seen on December 27 in Eskildsen’s CaK images at a latitude of North 46 degrees as well as on January 2nd at a latitude of South 28. Because of their sizes, the regions were not named. Overall Solar Activity remained Very Low and the rotation ended with Spotless Day 374, one C-class and 10 B-class flares. This time we would like to feature some images submitted by three of our observers, Dave Tyler’s close up of AR2732, as well as Guilherme Grassman and Howard Eskildsen’s CaK images. Please click the thumbnails below to see the full images. Thanks to all contributors for another great rotation. Please take a look at all the drawings/images by clicking on the link above which will bring you to our archive for CR2212. Carrington Rotation 2211 covered the time period from 2018-11-23 0411 UT – 2018-12-20 1152 UT. The rotation had four Active Regions, AR2728 which lasted two days, AR2729 five, AR2730 one, and finally AR2731 with two days. For 17 days no sunspots were observed. The highest Daily Active Region Area for the rotation was 60 millionths on December 7th while the total active region areas for the rotation was only 230 millionths. The highest Wolf number for the rotation was 16 on December 8th. During the rotation, an area showing Cycle 25 polarization could nicely be seen on December 16th in Eskildsen’s CaK image at a latitude of South 20 degrees. Because of its short life, the region was not named. Overall Solar Activity remained Very Low and the rotation ended with Spotless Day 352 and no C-, M- or X-class flares. This time we would like to feature some images submitted by three of our observers, Frank Melillo, Guilherme Grassman, and Howard Eskildsen’s CaK image with the December 16th Cycle 25 polarized area. Please click the thumbnails below to see the full images. Thanks to all contributors for another great rotation. Please take a look at all the drawings/images by clicking on the link above which will bring you to our archive for CR2211. After a break in the fall issue of the JALPO, ALPOSS Coordinator and Scientific Advisor Richard Hill continues his papers covering the analysis of the activity of the Sun’s Carrington Rotations using the images and reports submitted to the Solar Section with a report on: CR2202 thru CR2205. 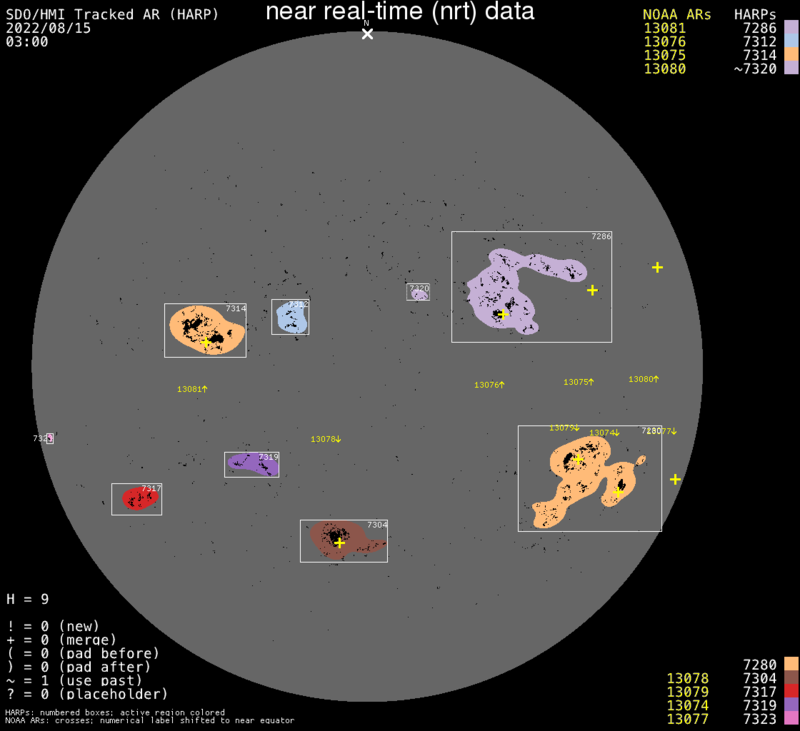 This report covers the period from 2018-03-22 2229 UT, thru 2018-07-09 2038 UT. The reports are based on over 882 image and observation submissions by numerous contributors to the Solar Observations Archive. The report was published in the 2019 Winter issue of the ALPO Journal, the Strolling Astronomer, and can now also be accessed as a standalone document on ALPOSS Solar Observations & Reports page, or by downloading it, by clicking on the picture below. Carrington Rotation 2210 covered the time period from 2018-10-26 2051 UT – 2018-11-23 0411 UT. The rotation was mostly spotless while accumulating 19 spotless days, but had two named active regions, AR2726 which lasted three days, and AR2727 with 5 days. The highest Daily Active Region Area for the rotation was 60 millionths on November 18 and 19 during AR2727. The highest Wolf number for the rotation was 14 on November 17 and 19. During the rotation, two areas showing Cycle 25 polarization could be seen in SDO’s magnetogram in the higher Northern latitudes. The first one from November 8th through 10th. The second for a number of hours on November 17th. Based on its naming requirements, SWPC did not name either of these areas, but SILSO took exception and did count them as spots. During the rotation, the sun produced a total of 6 A-class flares of which the largest was an A 5.3 class flare. Overall Solar Activity remained Very Low and the rotation ended with Spotless Day 335. At this point I would like to clarify some statistics. Several organizations keep records of sunspots and the Sunspot Number. ALPO-Astronomy does not. My research, which I cite in these short reviews, contains data derived from published data from SWPC, which is a division of NOAA. This division is responsible for naming Active Regions (numbering). SILSO and the Solar-Terrestrial Center for Excellence are organizations tasked with the creation and dissemination of the Sunspot Number. They are connected to the Royal Observatory in Brussels Belgium. In addition, several other and country based organizations maintain their local Sunspot Numbers. Since I use other data than the Wolf Number such as active region areas and flares, I base my statistics on the raw data supplied by SWPC daily. One of them is their SRS reports which are published daily at 0030 UT. This is the reason why my sunspot related statistics may differ from others cited elsewhere. This time we would like to feature some images submitted by three of our observers Guilherme Grassman, Howard Eskildsen with the November 8th Cycle 25 spot, and Theo Ramakers with the November 17th Cycle 25 area in Ha. Please click the thumbnails below to see the full images. Thanks all contributors for another great rotation. Please take a look at all the drawings/images by clicking on the link above which will bring you to our archive for CR2210.